Just the other night my husband was out for the evening, so I took my daughter to the local Chick-Fil-A for dinner. It was "Family Night" which means some kind of free, fun activity and that night it was face painting. 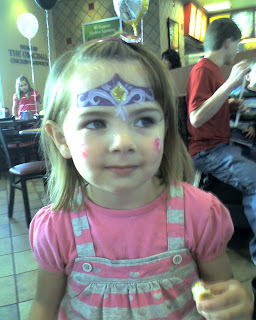 Vanessa loves anything princess, so of course she chose the princess crown for her face paint! I love my little princess!